No entries for October 2010. I came across a couple of blog posts (listed below) about "Trojan.Spy.YEK, the Corporate Spying Tool"
The blogs detail a spying trojan that scans your computer for key Operating system information, archives(ZIP), document files including PDFs, emails and email address books. The Shadowserver malware repository had the binary with MD5 hash e8f62bbf674ad74f3a25dbe0e7a0a473, so I wanted to give it a quick look to see exactly what it was doing and where it was going. Followed by the contents of the document. I then saw the same for filename="secret_document.pdf"
I also noticed other POST commands associated with dropping a new binary called 'rebirth.exe' and another that requested the file="total_info.dat" which provides detailed information on the operating system configuration. 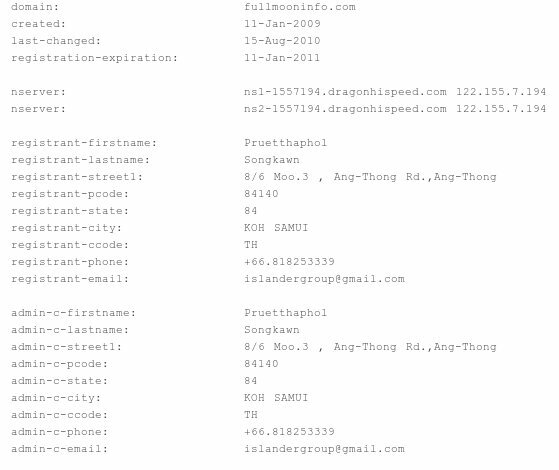 The following is the whois information for 'fullmooninfo.com'. Currently this domain is being hosted on IP Address: 122.155.7.194. This appears to be a shared host as Passive DNS queries show over 50 domains being hosted here. This IP belongs to ASN 9931 - CAT-AP - The Communications Authority of Thailand. Reverse DNS on that IP shows ns1-1557194.dragonhighspeed.com. While in-depth analysis of the malware still needs to be done, initial examination indicates that this is something that should be followed closely. Shadowserver is in the process of attempting to sinkhole any domains associated with this trojan, so that any victim IPs can be identified and reported.